We provide 24/7 monitoring and have set our Service Level Objectives for our infrastructure to provide the most reliable service to our Kintone.com clients. Click here to download the full uptime report. When and if necessary, regular maintenance occurs the second Friday of the month, unless the 1st of the month lands on a Saturday or Sunday – in which case it will be conducted on the first Friday. If there’s a need for occasional maintenance, at least 1 week advanced notification will be given. Kintone operates a fully redundant system which includes servers, networks, storage, and data (Hyperlink to 4 DLP (Data Loss Prevention)​. Standard support hours are Monday through Friday 9 am – 5:00 pm PST. More detailed Support SLA can be found here. The Storage Server set has 12 hard disks per server. 10 of the 12 hard disks were implemented with RAID6. RAID6 allows for two disk failures within the RAID set before any data is lost. The 2 additional hard disks are prepared as “hot spares”. Customer data is updated to the storage server and the replication storage server simultaneously. This RAID1 ‘mirroring’ system protects against the loss of data due to storage server failures because of hard disk failure or power supply failure. 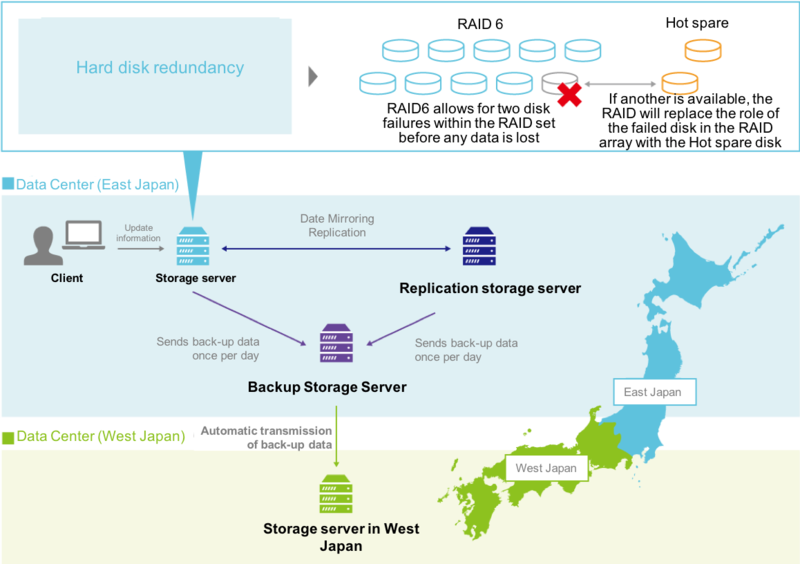 The East Japan Data Center (EJDC) maintains storage servers, replication storage servers and backup storage servers. The most recent 14-days of data is stored there. Backup data beginning from one day prior to the current day can be restored. Restoration capabilities are tested daily. The West Japan Data Center (WJDC) has remote backup storage servers in case of any catastrophic event affecting the EJDC. All backup data stored in the backup storage servers in EJDC are automatically backed up to the WJDC. The data centers that house and manage Cybozu.com servers, including Kintone.com, comply with the requirements of the The Center for Financial Industry Information Systems (FISC) Facility Safety Standards, considered one of the strictest compliance agencies in Japan. (Cybozu Inc is Kintone’s parent company). The data centers meet Tier 4 specifications, the highest level, for most of the categories in the Data Center Facility Standard regulated by the Japan Data Center Association. As detailed below in Section 5, Server Security, Kintone maintains an A+ rating for server security by Qualsys, the leading provider of infrastructure security compliance solutions. After service, retired hard disks shall be physically destroyed to prevent any possible information leakage from such disks. Cy-SIRT (Cybozu Computer Security Incident Response Team) is an in-house expert security group created to prepare against and handle any Security incidents. Cy-SIRT helps create policies to protect against threats and responds rapidly and in real-time to identify, contain, and eradicate threats as they arise. To prevent Human Error, systems shall be tested and verified several times before updates occur. The Product Environment and Remote Backup Environment shall be separated and prohibited to operate simultaneously . When data is deleted in Product Environment, that data can not be deleted at the same time in the Backup Environment. Automation is implemented to minimize failure probabilities caused by human error. Kintone.com promotes automation wherever possible instead of manual system operations. For example, the creation of a client sub-domain environments and adding and cancelling services are all automated. Manual operations performed by humans shall be done while following prescriptive manuals. All such manual operation activities however, shall be logged automatically. In an emergency case, humans operating the system without a manual is permitted. However, even in an emergency case, working alone is prohibited as 2 or more authorized technicians must work together. Kintone encrypts all data both in transit and at rest. Learn more. All data is encrypted as it moves between our servers and your web browser. 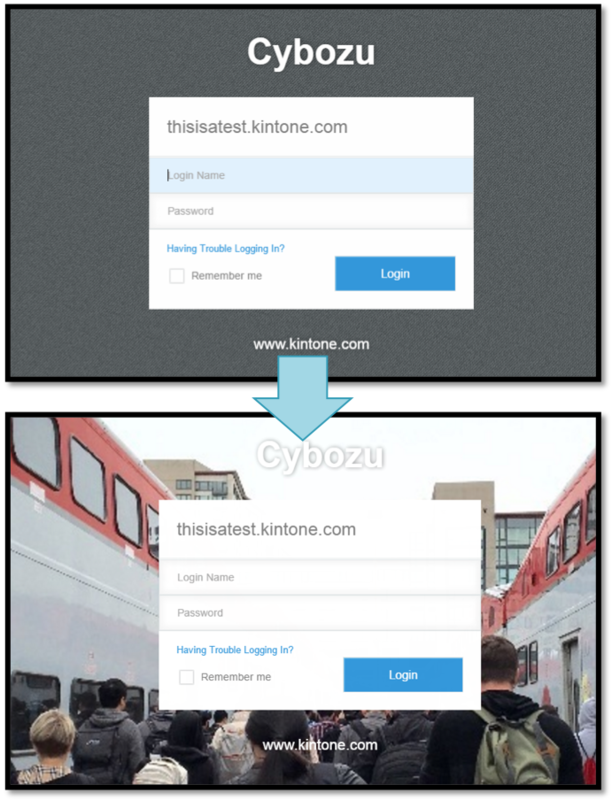 The Kintone service is offered only with SSL connections, and provides optional IP address connectivity restrictions, 2-Factor Authentication and basic authentication. Our Data at Rest Encryption encrypts all inactive data stored within our servers. Kintone uses a 512 bit key length encryption scheme, the same used in Windows BitLocker and OS X FileVault. Our Server Security level is confirmed as A+ by Qualsys’ SSL Labs per below. A vulnerability assessment is the process of identifying and quantifying security vulnerabilities in a software environment. 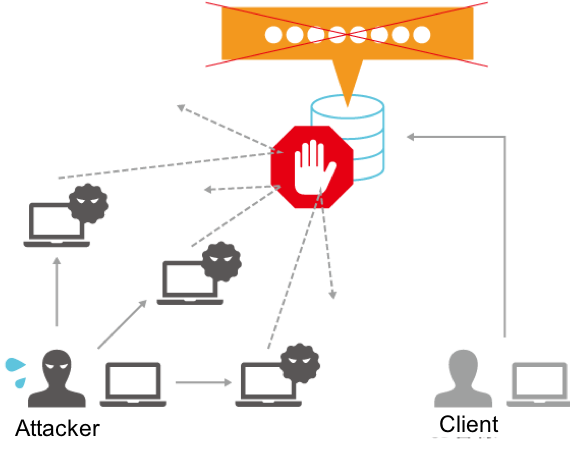 A penetration test simulates the actions of an external and/or internal cyber attacker that aims to breach the information security of the organization. Found a security problem? Report it here. Kintone.com has an “autonomous decentralized agent system’ called “Tsukuyomi”, a prophet in Japanese mythology who can predict future events. Appropriately, this system is designed to prevent, detect, and correct faults or failures and initiate recovery in the Kintone servers​. In the “Tsukuyomi” system, Servers monitor each other to detect faults or failures. After detection, the automatic recovery process instantly replaces the fault server to the spare server. If multiple servers go down, then special recovery plan will be initiated. Network monitoring systems and intrusion detection/prevention systems continuously monitor the Kintone system. 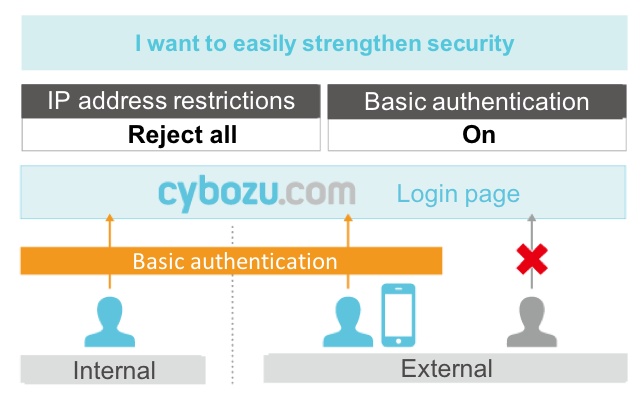 Secure access settings can be reviewed and set in the Security & Authentication admin control panel displayed below. Setting Changes are reflected immediately. 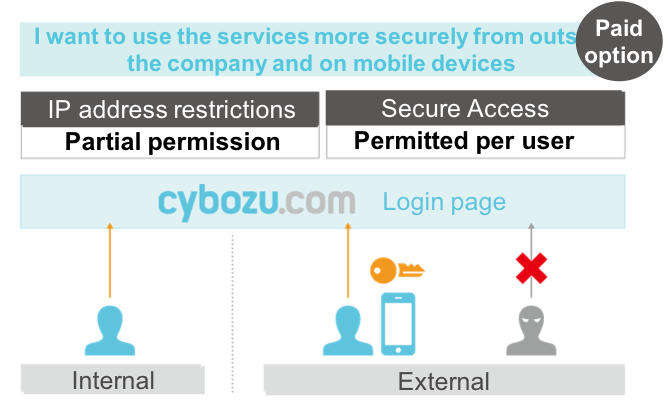 – Client certificates can be issued for individual users to install onto their devices in order to gain a unique access gateway through the IP fencing restriction setting. 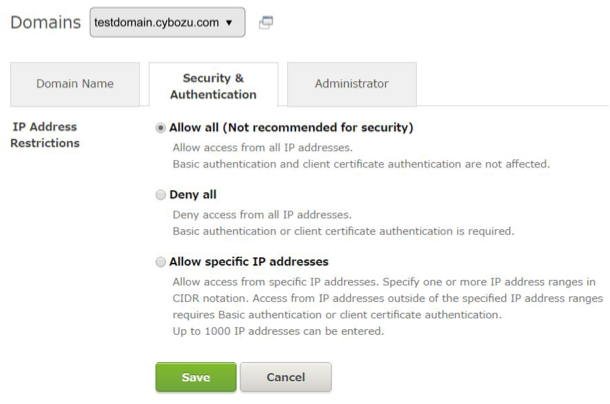 – Certificates can be set to expire at set time intervals and re-issued easily. The following is a list of password settings that can be configured when setting up a Kintone account. Account lockout duration – length of time the lockout will occur. You can browse and download the audit log of operations such as logins, modifications, file downloads, etc. Custom audit log settings can also be set to initiate notification emails. Cybozu Inc’s Cybozu.com and Kintone.com cloud infrastructure has achieved ISO 27001 certification of our Information Security Management System (ISMS) covering our infrastructure, data centers, and services. Design, construction and maintenance of operational infrastructure of a cloud service developed in-house. Initial ISO 27001 certification registration date was November 10th, 2011 with subsequent audit updates occurring since. 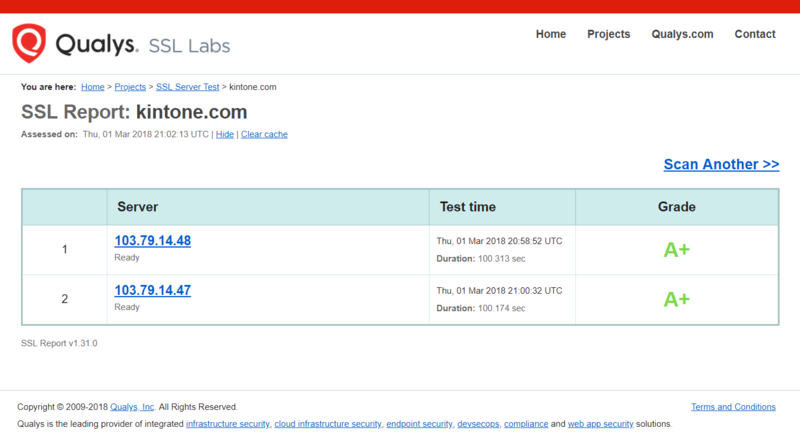 As mentioned above, the data centers the Kintone.com cloud is currently operating from comply with The Center for Financial Industry Information Systems (FISC) Facility Safety Standards, considered one of the strictest compliance agencies in Japan. In fact, the data centers meet Tier 4 specifications, the highest level, for most of the categories in the Data Center Facility Standards as regulated by the Japan Data Center Association.